Washington Gov. Jay Inslee, on a mini-barnstorm of cold, snowy and wind-whipped New Hampshire, discussed climate change with students on two college campuses Tuesday. The Democrat’s trip to the first-in-the-nation primary state comes as he says he’s “seriously considering” a run for president in 2020. 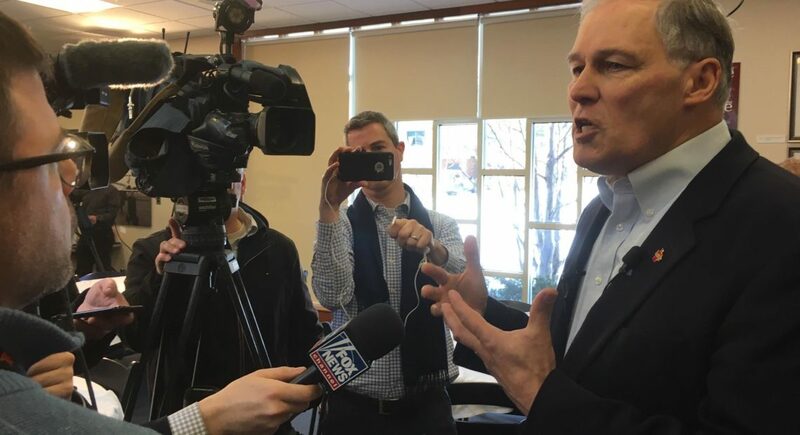 At the New Hampshire Institute of Politics on the campus of Saint Anselm College, a Catholic Benedectine institution in Manchester, the state’s largest city, Inslee held a roundtable with approximately 40 students and discussed the threat of global warming. 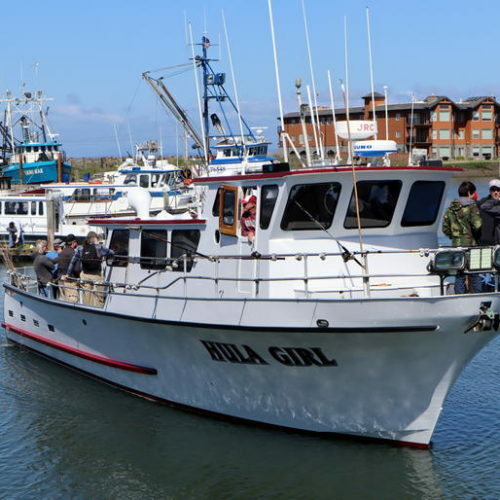 “We are the first generation to feel the sting of climate change and we are the last generation who can do something about it and it is my belief that when you have one chance in life, you need to take it,” Inslee said. 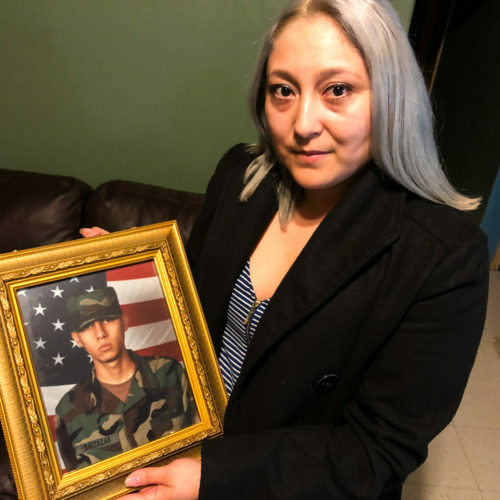 “I would definitely consider voting for him if he did run because you can tell that he knows so much about the issue and he’s already taken action,” Husband said. “Given the breadth of the field that’s running, you’re thinking [former Vice President Joe] Biden might run, Kamala Harris is in, [Sen. Elizabeth] Warren’s in, you’ve got a very diverse field, you have a wide field, I don’t see him getting very far,” Flaherty said. Christopher Galdieri, an associate professor of politics at Saint Anselm, listened to Inslee’s talk on climate change and said it’s smart for a lesser-known candidate to emphasize a single issue. 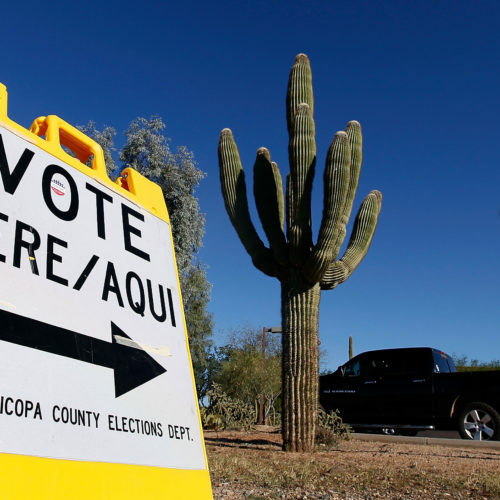 “The question is can he turn that into enthusiasm among voters,” Galdieri said. Inslee’s second stop was Dartmouth College, a 250-year-old Ivy League school in Hanover, an hour-and-a-half northwest of Manchester. There he had pizza and talked about climate change with Dartmouth Democrats. 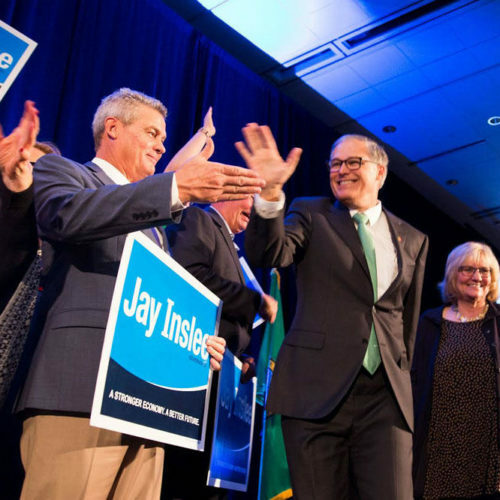 But it was a question from Gary Brooks, a Dartmouth graduate who teaches at Vermont Law School, that prompted Inslee to talk about whether he can compete as a 67-year-old white male at a time when the Democratic Party is becoming more diverse. Inslee launched into a lengthy response about his efforts to recognize and address racial and gender inequities, including his recent endorsement of Initiative 1000 to once again allow affirmative action in Washington. 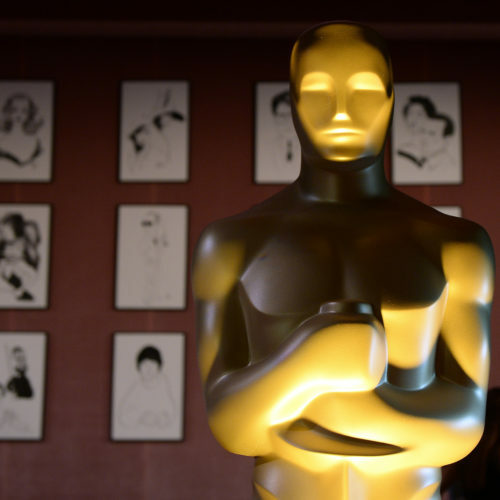 “I and people in my situation have an added responsibility to be dedicated to increasing opportunity for everyone and rooting out implicit bias everywhere that it exists,” Inslee said. 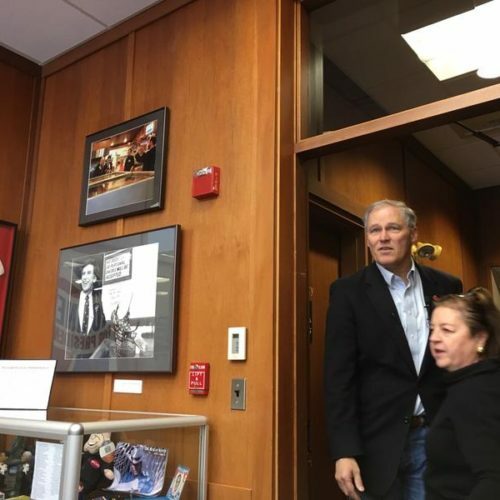 On Monday evening, Inslee had been scheduled to attend a private fundraiser for the League of Conservation Voters in Concord, the state’s capital. However, Inslee’s flight leaving Newark was delayed and ultimately cancelled and he missed the event. He also missed a planned beer and podcast event at a Concord tavern. Inslee and his small entourage ended up driving from New Jersey to New Hampshire. 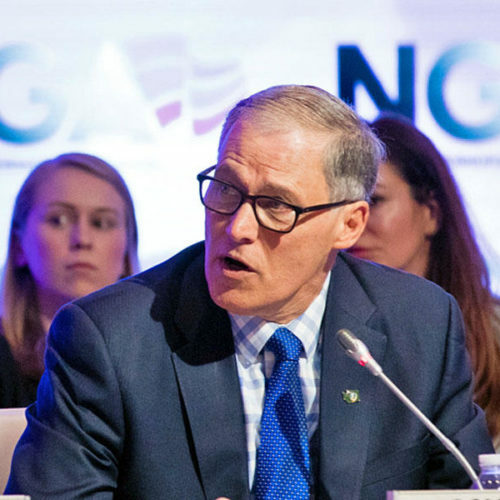 Challenged by Brzezinski to address voters who don’t feel the economy is working for them, Inslee said combatting global warming offers the opportunity to create clean energy jobs. 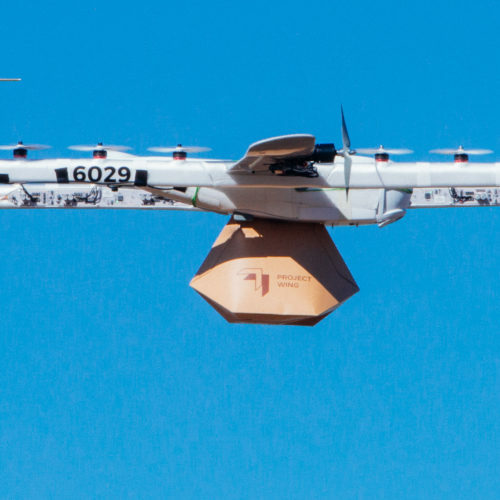 He also spoke of his proposed “suite of five measures” now before the Washington Legislature, which includes a 100 percent clean energy plan and a proposed low-carbon fuel standard. “This is a time of great peril, but it is also a time of great promise,” Inslee said in the MSNBC interview. Inslee, a former member of Congress, called on Republican senators to “say enough is enough” and vote to reopen the government. Inslee, who’s not yet registering in early presidential polls, faces a number of challenges as he explores a possible bid for president. Chief among them: he’s a not-very-well-known governor from an out-of-the-way state where the last serious presidential candidate was Sen. Henry “Scoop” Jackson in the 1970s. 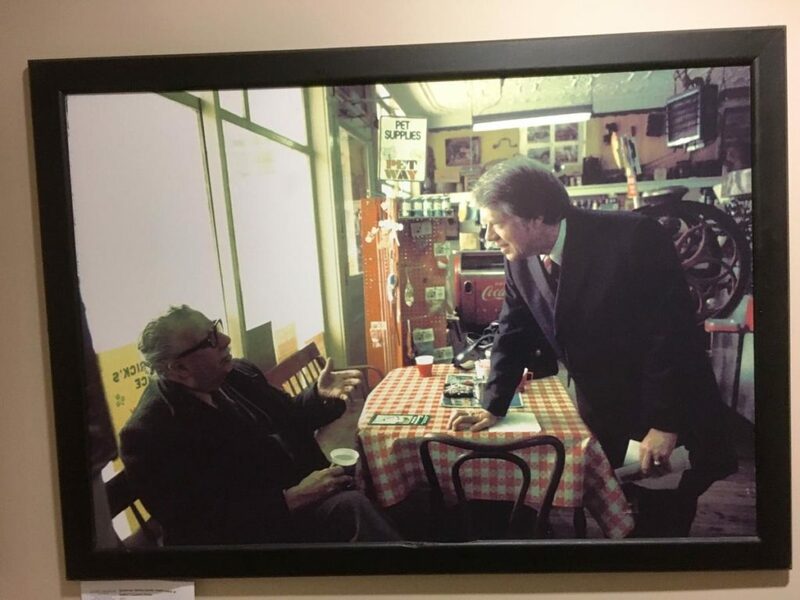 As Inslee walked through the New Hampshire Institute of Politics, he stopped at a photograph of Jimmy Carter campaigning at Robie’s Country Store in 1975. The executive director of the institute, Neil Levesque, told Inslee the story behind the photo. “And he came in and they said ‘Jimmy who’ and he had two percent name ID and he won [the New Hampshire primary] with 26 percent of the vote,” Levesque told Inslee. “Small state governor with no name ID ends up president of the United States … wonder how that could happen?” Inslee said to laughs. 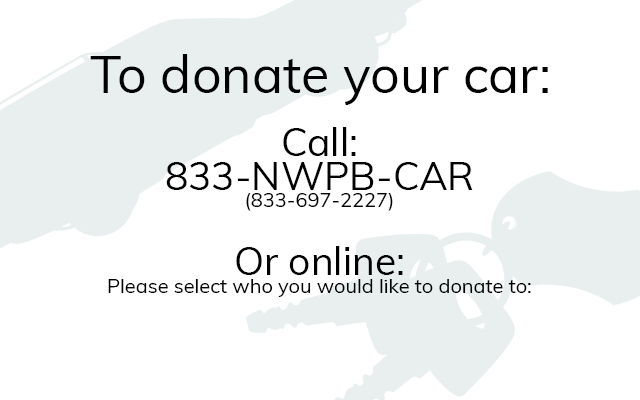 In October, Inslee formed a federal political action committee, called Vision PAC, which allows him to raise money to explore a potential run. 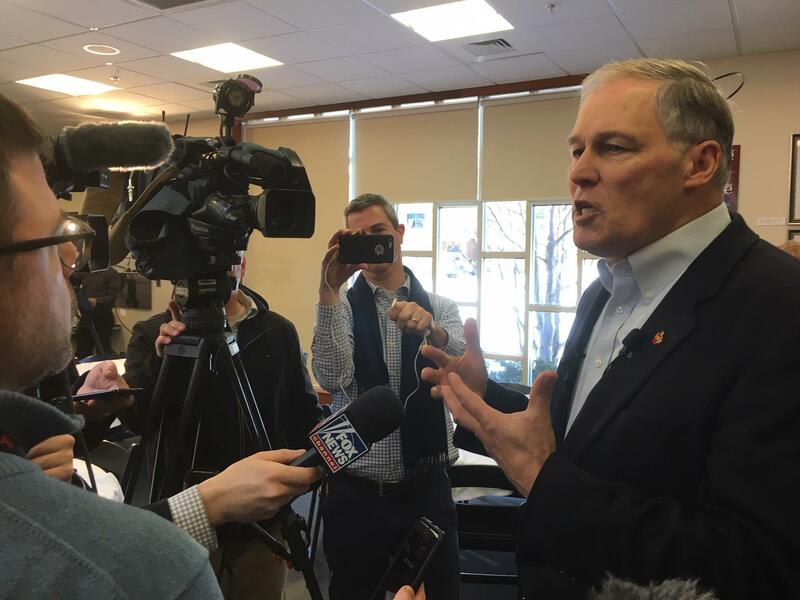 Inslee has said he will formally decide if he’s a candidate by this spring, although in New Hampshire he hinted a decision might be coming sooner rather than later. What remains to be seen is whether Inslee can commit the time and muster the money needed to compete aggressively next year in the four early contest states: Iowa, New Hampshire, Nevada and South Carolina. As he wrapped up his visit to Dartmouth Tuesday, Inslee took a group photograph with several students who are from Washington state. 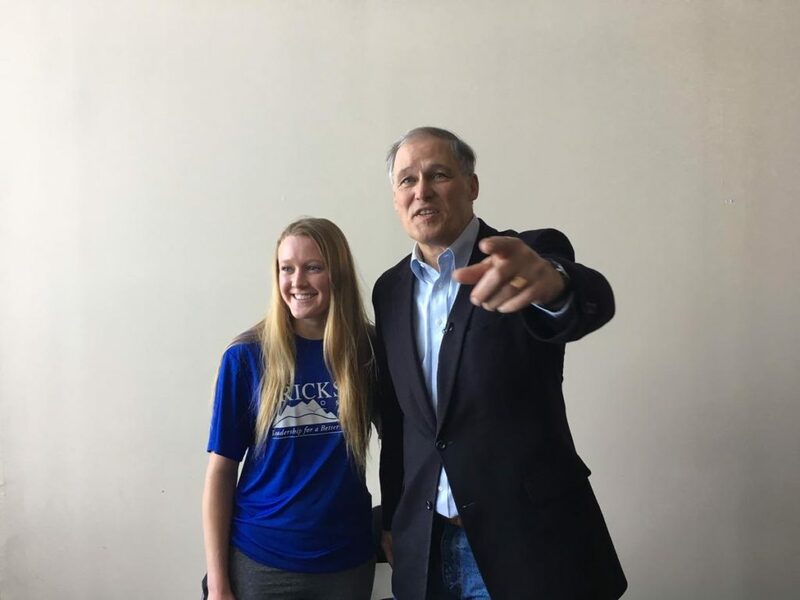 Among them was Elsa Ericksen, the daughter of Republican state Sen. Doug Ericksen who has been one of the fiercest critics of Inslee’s climate policies. When she introduced herself, wearing one of her dad’s campaign t-shirts, it led to a lighthearted moment.